Since I was a little kiddo my favorite breakfast has been Toad In A Hole. 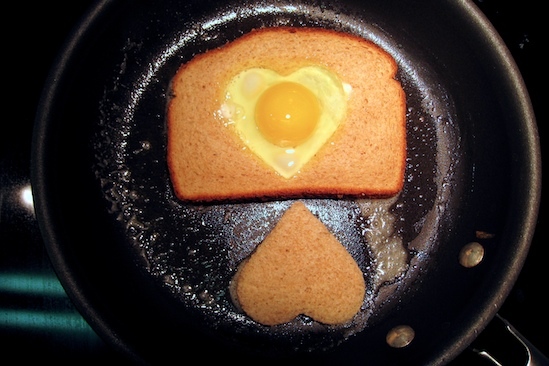 It’s simply an egg cooked inside a piece of bread and not only is it as cute as can be, but you have your toast right there, ready to soak up the yolkness! Now that I have aged a bit and acquired a more, well, sophisticated pallet, I thought it was time to make a few tweaks. I used gluten free bread, obviously :o) and feel free to experiment with different types of cheese, I know I will. A sharp cheddar would be awesome with the avocado. A cookie cutter, or something to make a cut out in the bread. OH how cute would heart shaped ones be on Valentines Day!? Cookie cutter a hole into the bread, reserve to toast with breakfast, or if you are impatient like me, eat it while you are waiting for your egg to cook. Adjust cooking times depending on how runny you like your eggs. This left them still runny as you can see. For Valentines Day I’m doing this! At what point do you go from being able to have a few margaritas and still feel like 100 bucks the next morning OR have a few margaritas and wake up absolutely crabby!? Does this aging happen over night, literally?! Last night Mindee and I had dinner (and margaritas) at Tacolicious in the Marina- a neighborhood where the pitch of women’s voices reach a frequencey unlike anywhere else in San Francisco and all the men look and dress the same. Not exactly mine and Mindee’s type of neighborhood… it’s the authentic tacos and margaritas, not the well groomed men, that keep us coming back for more. By sun down and the time it takes Mindee and me to finish our first margarita, this place has gone from taqueria to swanky, sleazy, sweaty bar! These aren’t the sugar packed and pre mixed margaritas, but rather made with actual lime juice and good quality tequila! So good, they go down like juice! Anyway, I woke up feeling, well you know the feeling, not entirely chippery, to say the least. And the only thing sounding remotely appetizing is something hot, spicy and greasy! I mixed together what I had on hand, canned crab (is that tacky?) bell peppers and hot sauce and the result were these perfectly little moist crabby cakes! yum! Enjoyed anytime of day for any occasion, casual or fancy, hung-over or chippery, these little guys are a pleaser for sure! I topped them with homemade herb aioi to really add to the fat-factor! Transfer the sheet to the oven. Amaretto is an Italian, sweet, smooth, almond liquor. It is wonderful in cookies, and cakesor even savory dishes like lamb. My dad is a retired Italian man, which mean the 3 liquors always on hand are: grappa, limoncello and amaretto. A couple other kitchen staples of my parent’s are bananas and plain Greek yogurt. One morning I was staying at my parent’s house and decide to throw these flavors together for breakfast. This is shaping up to be a deliciously spiked Sunday…. I put this over greek yogurt, but how delicious would this be poured over pancakes!? My Summer Soup has a name and it’s “Pistou”! I love making fresh vegetable soup with a mix of beautiful seasonal veggies. I had no idea that the product of my mornings trip to the farmer’s market is a specialty in Nice, France. You see, I belong in France! You can get creative with the ingredients and ratios. Do not make this so technical. If you want more of one veggie than the other, go for. Pasta shells or rice is nice here too. If using rice add it in the first step. For pasta add it with the beans. I loooooooove pesto, and have so much fun experimenting with the herb and nut combos! This recipes is one of my favorites and in an attempt to make it a little more of a guilt free spread I gave it a few tweaks. I skimp on the oil, keeping the calories down and making it a thicker, and use Brazil nuts instead of the traditional pinenuts. Brazil nuts are super healthy for you and I just read that they are considered a complete protein (here) woooah! I like to get creative with this type of spread, I think you will have fun experimenting with the combinations too! So I guess really there is nothing “pesto-y” about my version except that it is a combination of herbs, cheese and nuts. Traditionally pesto genovese (originally from Italy, Liguria) is made with basil, pine nuts, garlic, parmigiano and olive oil. The best pesto outside of Liguria (and I would know!) is at Farina in San Francisco’s Mission District. Really, you will be licking your plate! Oh I just thought of something great! How delicious would a poached egg be on top? So the order would be: toast, asparagus, egg, crumbled feta. Ah, I cant wait to try it! can’t it be tomorrow morning already!? Ok, this may look time consuming but it is sooooo simple. I literally cooked everything at the same time on one pan. *oh, if your marinated cheese has been in the fridge like mine, place it in the oven to warm up (in an oven proof dish). The oven will be warn because your broiler is pumpin! I am so overwhelmed right now with food, I don’t know where to begin. Lists. Lots of them. Big ones. Recipes I’ve made and need to share. Recipes I’ve had on recent travels and need to share. Recipes that look delicious and I must make, devour and share. 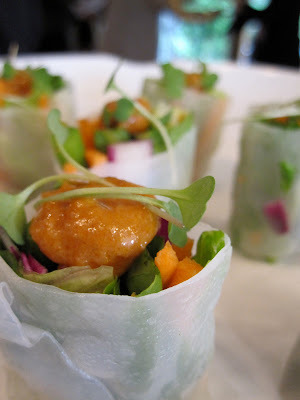 Checking off a recipe from my “I’ve made and must share list” are these fresh little bites of springtime. Fresh Herbs are the key ingredients, but really anything seasonal and fresh will be great. The filling possibilities are endless! I make these for vegan clients for their lunches and as appetizers at private parties. They can last a couple days in the fridge with a wet towel around them. 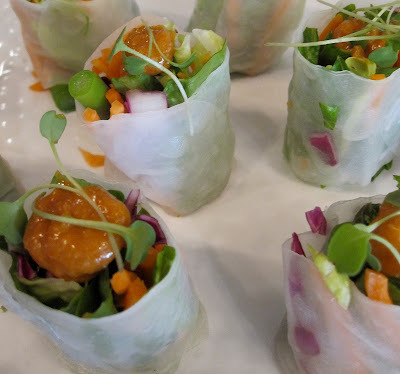 Therefore, I recommend making a bunch… rolling takes a while to get the hang of, so the first few may be a little wobbly looking, and the assembling is easy once you have all the ingredients laid out and ready to go. I admit, I can be a foodie brat sometimes. And the fact that I don’t eat wheat, factory farm animals and processed foods make it all the more difficult to please me. With that said, I am more than happy with a well seasoned, perfectly cooked bowl of beans and rice Not to mention, beans and rice make a complete protein. The picture above is of one of my favorite meals in Istanbul, a restaurant right outside the walls to the Istanbul University in a beautiful plaza on a beautiful afternoon. It was 2 pm and very table was occupied by groups of friends from the university: well dressed and well mannered. Our meal ended with Turkish coffee and what other than…baklava! I’m in Turkey and midway through my month long hiatus from reality (aka work and responsibilities) when I started feeling a little anxious. The thoughts like, “What the hell am I doing? I can’t just leave for a month? I have a life back home, emails to return, clients to cook for, responsibilities, bills to pay” started haunting me. We had plans to go horseback riding in an hour and I knew I needed to calm my nerves before hopping on a horse. At this point my stomach is turning, though I hadn’t eaten all day, and the only thing sounding appetizing is a bowl of creamy rice goodness. Luckily for me, this is a specialty in Turkey and sold at every corner bakery. Place the pudding rice in a deep, heavy pan, pour in enough water to just cover the rice and bring to the boil.